One of my guilty pleasures is watching the TV show Hell’s Kitchen on Fox. This show doesn’t feature the best Chefs out there (Like Top Chef) but it is still a fun show to watch. One of the dishes featured on Hell’s Kitchen is Beef Wellington. I have tried making this before at home but it did not turn out very good. Recently I saw a post on Facebook from Tip Hero for Individual Beef Wellington’s. This short video and recipe inspired me to try Beef Wellington one more time and retool the recipe for the Big Green Egg. Now sit back, grab a glass of your favorite Cabernet Sauvignon, and enjoy this post for Kamado Mini Beef Wellington. It all starts with nice cuts of beef tenderloin (Filet Mignon). For this recipe I am not using Pâté but I am using Duxelles (which is finely chopped mushroom mixture). First, you must sear the beef on all sides to get a nice color. Once seared place the meat in the freezer to cool rapidly. While the beef is cooling make the Duxelles. Once this is reduced place the mixture in the refrigerator to cool. After your meat and the Duxelles are cooled completely you will make the individual Wellington’s using a half sheet of puff pastry dough to place the ingredients inside. Roll the dough to form a tight ball, cover with saran wrap, and place them in the freezer until your grill is preheated. Preheat the BGE to 425° and use a ConvEGGerator for indirect grilling. Once the egg is preheated and the temp stabilized remove the wrapped beef from the freezer and brush with an egg wash on top of the dough. Place them on a baking pan lined with parchment paper and let them cook 20-30 minutes or until they measure 130° internally for Medium Rare. Once the meat measures to the correct temp using an instant read thermometer pull them off the grill and let them rest on a wire rack for 10 minutes. Now slice the individual Beef Wellington’s and serve! This recipe for individual Beef Wellington's from Tip Hero has been modified for the Big Green Egg. Heat a cast iron skillet over medium-high heat. Add the vegetable oil and heat until just starting to smoke. Rub the meat generously with salt and pepper. Once the pan is very hot, sear the two filets very briefly on each side. You don’t want to cook the interior of the meat at this point, so it shouldn’t be more than a minute or two per side. Remove the filets from the pan and place on a plate in the freezer while you make the filling. Let the pan cool slightly and turn the heat down to medium. Add the mushrooms, onion and garlic to the pan, and sprinkle on salt and pepper. Cook until the mushrooms release all their water and the onion is translucent. Add the sherry and thyme. Cook until the sherry evaporates. Taste for salt and pepper, and season as necessary. Remove from the heat and refrigerate until cold, then stir in the chopped parsley. Roll out one puff pastry piece and cut in half, so you have two rectangular strips of dough. Remove the steaks from the freezer and brush with the Dijon mustard on both sides. Put a quarter of the mushroom mixture in the middle of one piece of the puff pastry. Top with one steak, then add a quarter more of the mushrooms. Repeat with the other steak, puff pastry piece and mushrooms. Fold the long sides of the pastry over the steak, tucking in and tightly sealing all the edges so the juice doesn’t escape. Wrapping it all in plastic wrap can help! Preheat the Big Green Egg 425° and line a baking pan with parchment paper. While the oven preheats, put the wrapped beef in the freezer. Once the BGE is hot, remove the beef from the freezer and put them on the lined sheet pan. Coat with the egg wash.
Cook for 25 minutes or until a thermometer inserted into the middle of the steak reads 135 to 140 degrees Fahrenheit (medium-rare) and the pastry is a deep golden brown. 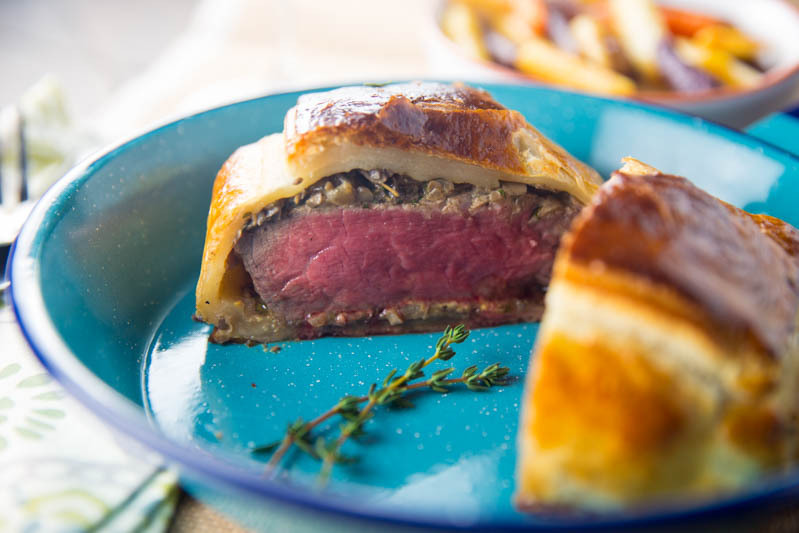 Cut in half so you can see the intersection of steak, pastry and mushrooms, and serve.